The first thing that you need to do before any new installation on your Joomla website, is to create a full backup of your files and database. This will allow you to restore your website to it’s working state if anything goes wrong with the new module installation. For more information on that, you can review our tutorial on How to create a full backup of your Joomla website. 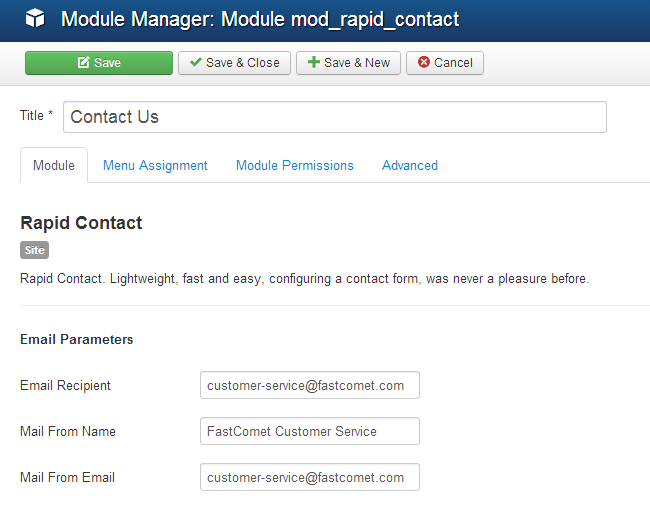 The Rapid Contact extension will allow you to add contact forms on your website. It is important to provide a way for your website users to give you feedback. This is one of the best techniques to improve your website in the future. The Rapid Contact extensions adds a contact form on your website and all of your users will be able to send you a feedback using it. You can download the extension from the official Joomla extensions directory. You need to select the Contacts & Feedback category and then Contact Forms. Then simply review for the Rapid Contact extension from the list on the screen. The installation of the Rapid Contact extension is standard. We do have an excellent tutorial on How to install and uninstall extensions in Joomla. Log into your website as administrator and navigate to the Extensions tab from the top menu and then Module Manager. Click on the New button at the top. You need to select a module type. Scroll down the list of available types and select Rapid Contacts. Title - Enter the title for the new module that will appear on your website. Module - This tab will allow you to edit the main features of the module. The most important one is to ensure that you enter a valid email address in the Email Recipient field. You will receive the messages from your users within that email account. Menu Assignment - You can specify the module's availability on your website. Would you like to display it on all pages or on specific ones only? Module Permissions - Edit the module's permissions for the different user groups. If you are not sure about this process, leave the default ones. Advanced - This tab will allow you to set the cache settings for the module, style, header tag and class, etc. If you are not sure on what data to edit here, simply leave the default values.